One of the factors in choosing to visit, study in or immigrate to another city is the vibrancy of its cultural life. If you are interested in classical music, the city of Montreal is without a doubt one of its leading centres the world over. The classical music scene is so vibrant in Montreal that on a typical Sunday afternoon during the autumn, for example, you may well have eight or ten or even more high-level concerts being performed around the city. It is our pleasure to share with you some of Montreal’s classical music treasures. At the top of our classical music pyramid is the world-famous Montreal Symphony Orchestra, known officially by its French name l’Orchestre symphonique de Montréal (OSM). The Montreal Symphony has had among its resident conductors such famous musicians as Otto Klemperer, Igor Markevitch and Zubin Mehta. During the 24-year leadership of Charles Dutoit, the OSM recorded many award winning CDs and toured the world to critical acclaim. Following Dutoit’s abrupt departure in 2002 due to a spat with certain members of the musicians union, the orchestra fell on some difficult times with no one steady hand to guide it. Enter its current music director, Maestro Kent Nagano, who began his tenure in 2006 and whose contract was just extended until 2014. Under Nagano’s precise and intelligent leadership, the OSM has recaptured its artistic excellence, recorded several CDs earning warm reviews, and toured in Canada, the United States and Europe. He is hugely popular with Montreal audiences, selling out virtually every concert conducted by him. Maestro Nagano’s schedule includes many international guest appearances as well as his post as General Music Director of the Bayerische Staatsoper in Munich. Montreal’s other professional symphony orchestra is the Orchestre Métropolitain, led by the Montreal-born international sensation Yannick Nézet-Séguin. Under his leadership, the OM has also recorded several symphonic works to high acclaim. Mr. Nézet-Séguin also acts as music director of the Rotterdam Philharmonic, and is the music director designate of the Philadelphia Orchestra. The high esteem in which both Maestros Kent Nagano and Yannick Nézet-Séguin are held around the classical music world is evidenced by the fact that the well-known UK magazine Gramophone recently named both of them among the 10 finalists for its prestigious musician of the year award. Persons interested in studying music have a virtual gold mine in Montreal. The summit of Montreal’s vibrant music education scene is the world-famous Schulich School of Music of McGill University. The McGill music school boasts many members of the Montreal Symphony among its classical music faculty, as well as renowned soloists and chamber musicians. McGill’s music school also offers programs in the fields of opera and voice, jazz, music technology, and research on the effects of music on the brain. One of the world’s foremost recording studios is located at McGill, used by the OSM for its CDs. Other top-notch music teaching institutions Montreal include the music faculty at the University of Montreal, the Montreal campus of the Quebec Conservatoire de musique et d’art dramatique, as well as the music programs at the junior colleges (Cegeps) Marianopolis and Vanier. Many concerts are offered throughout the academic year at these institutions by their excellent student musicians whether as symphonies, chamber groupings, or soloists. Admission is usually reasonably priced and often free of charge. With all the music schools in Montreal, it is easy to find music teachers for private lessons. For example, individuals who do not wish to pursue a degree in music have recourse to the McGill Conservatory which offers the opportunity for adults and children alike to improve their musical theory and playing skills through high-level teaching. Opera fans are well served in Montreal. The Opera de Montreal will be presenting five different operatic works during its upcoming season. Those who prefer lighter fare have the option of enjoying productions by the McGill Savoy Society as well as by the Montreal West Operatic Society. Montreal has a thriving chamber music scene. The longest standing chamber group is the McGill Chamber Orchestra, whose Maestro Boris Brott is leading the ensemble into its 71st season. Montreal also lays claim to the fine chamber orchestras I Musici de Montreal, led by Yuli Turovsky, les Violins du Roy, which divides its main schedule between Quebec City and Montreal and is led by Bernard Labadie, as well Angèle Dubeau and her all-female group La Pietà. There are also several fine amateur chamber groups in Montreal including the Lakeshore Chamber Orchestra. Organizations promoting concerts by chamber music orchestras, quartets and soloists from September through to early May include the venerable Ladies’ Morning Musical Club, presenting its 119th season of concerts, and Pro Musica. 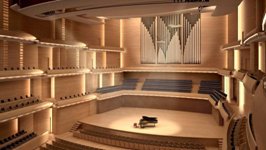 During late May the Montreal Chamber Music Festival attracts many international artists. Then in June, there is the Montreal Baroque Festival. The McGill International String Quartet Academy runs for 10 days starting mid-August at the Schulich School of Music. In addition to private lessons for students registered in the Academy, free public events include several master classes and concerts performed by accomplished quartets featuring young musicians from around the world. Then from late November to early December each year the Bach Festival takes place. Classical music spreads out from Montreal proper into the countryside during the summer. Starting early July to early August, the town of Joliette just northeast of Montreal is home to the Lanaudière Festival, which features the OSM, the OM, visiting orchestras, chamber groups and soloists, with many performances held outdoors at its beautiful amphitheatre. Around mid-August, the town of Orford, located in the picturesque Eastern townships, boasts its music school and festival, including the OSM, music tutorials by renowned musicians, and performances by the New Orford Quartet, among others. Montreal boasts a bilingual publication dedicated to classical music called La Scena Musicale. You might also wish to read background articles and concert reviews by Arthur Kaptainis in the Montreal Gazette newspaper. And why not give a listen to our all-classical music radio station CJPX? We trust you will agree that Montreal offers a vibrant classical music culture unsurpassed by any other city. We are happy to provide the following links to the organizations, events and other sources in the order mentioned in this blog so you may learn more about the great city that is Montreal. See you at the concert!